Large Size Pressure Reducing Valves – Plast-O-Matic Valves, Inc. Designed for higher flow capacities…achieved with less system pressure loss. • Downstream pressure setting is infinitely adjustable from 10 psi to 125 psi. • Maximum inlet pressure is 150 psi. • Sizes 3″ and 4″ in PVC. • Size 3″ in Natural Polypro. Note the 3″ size in Polypro is limited to 5-50 PSI set pressure. • Size 3″ in PVDF. • Balanced shaft provides smooth, non-stick operation; assures reliable service for millions of cycles. • Large surface area of the frictionless diaphragm provides exceptional sensitivity. • Double u-cups prevent leakage along the shaft and eliminate the possibility of “creep”. • Designed for low maintenance and easy to adjust. • High capacity, heavy-duty design. Corrosion resistant, also excellent for high purity and water applications. The standard connections are female NPT threaded ports. 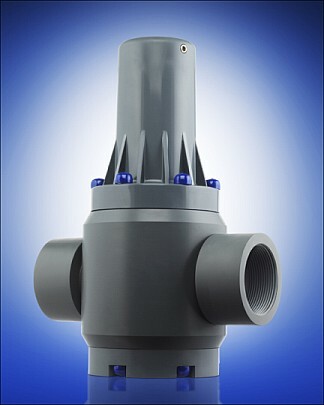 Socket, flanged and spigot connections are also available. Springs (not wetted) are steel. Adjusting bolts and external fasteners are stainless steel. Optional Xylan coated springs and fasteners available; consult factory. 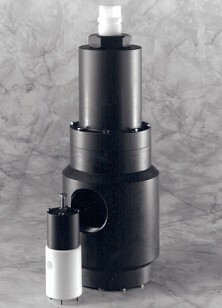 Some Kynar PVDF components are used in the Natural Polypropylene and PTFE models for strength. Adjusting bolt and lock nut on 3″ pressure regulator is HDPE. Pressure and flow performance of Series PRH exceeds that of any available spring-loaded thermoplastic pressure regulator, as the chart below indicates. For complete flow performance curves for specific sizes, and test results vs. specific competitive valves, please contact our Technical Group at (973) 256-3000. Drop-off is the difference between the pressure regulator set pressure and the actual downstream pressure. Test Parameters — Inlet Pressure: 70 PSI. Set Pressure: 35 PSI. Media: Tap Water. Temperature: 65 F/18.5 C. Valve size: 3/4″ machined body PRH. Important Notes — Dashed lines in curves above exceed the recommended maximum flow rate of 5 feet per second for thermoplastic piping. 10 PSI is the lowest permitted setting for Series PRH. At higher set pressures, the performance gap increases…Series PRH provides the best performance of all known spring-loaded pressure regulators. If even higher performance (near zero drop off) is required, please refer to Series PRA air loaded pressure regulator. • Sizes 1/4″, 3″ & 4″ in PVC. • Size 1/4″ in CPVC. • Sizes 1/4″, & 3″ (lower pressure range) in Natural Polypro. • Sizes 1/4″, 1/2″, 3/4″, 1″, 1 1/2″ in PTFE. • Sizes 1/4″, & 3″ in PVDF. To complete the part number, add the suffix -PV for PVC, -CP for CPVC, -PP for natural polypropylene, -PF for Kynar PVDF, and -TF for PTFE. For example, to order a 1/4″ PVC regulator with EPDM seals, the part number is PRH025EP-PV. 4″ part numbers are PRH400EP-PV (EPDM seals) and PRH400V-PV (Viton seals). For additional dimensional drawings, please click here and refer to PRH prefix and size. NPT is standard. For socket, BSP threads, metric, spigot, flare, flange, or other connection options, please consult factory. 4″ size custom built to order; please contact factory for lead times. Valve is shipped on a pallet via common carrier. Valve installation requires additional caution and support commensurate with safe engineering practices. NPT connections have an external (non-wetted) stainless steel reinforcement; for other connections contact factory. Made in USA. All of the above valves are machined and/or molded and machined, hand assembled, individually inspected, and tested under pressure at our Cedar Grove, NJ headquarters and carry our True Blue 3-Year Warranty. Product photos are representative and actual appearance may vary based on size and materials.